According to Pew Research Center, more than a fifth of Americans now identify as having no religion. Add that to urban parishes losing members to the suburbs, along with traditionally “ethnic” parishes closing as successive generations assimilate into the greater American society, and the question arises: What can be done to preserve the resulting abandoned churches, which are often beautiful testimonies to rich history? Across the nation, creative community members have saved their former churches from decay or obliteration by turning them into thriving art centers. SavingPlaces.org takes a look at a few successful examples. Swallow Hill Music Hall hosts concerts of all types of music, including a ukulele festival. 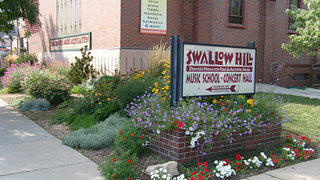 Once a Methodist church in Denver, Colorado, Swallow Hill Music Hall today is one of the largest organizations in the United States that promote musical performances of various genres tied to the academic study of music. In addition to showcasing a rich variety of musical performances (including an annual ukulele festival), the center offers music education to all ages and skill levels. Friendship Baptist Church in southwest Washington, DC, was a historically black church first designed in 1875. In 2013, the Blind Whino SW Arts Club opened in the former church. 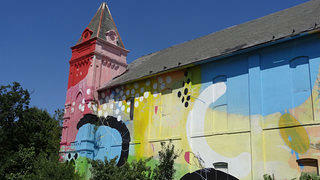 Its new owners decided to literally turn it into a work of art, with a colorful mural painted on its facade. Inside the structure, classes and exhibits are held regularly. 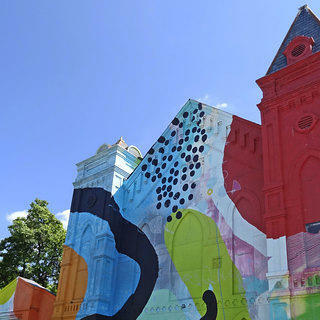 With a colorful mural painted on its walls, Blind Whino is a work of art itself. After serving a working-class community for 140 years, the Woodside Presbyterian Church in Troy, New York, held its last service in 2003. It was recently purchased and is being converted into the Contemporary Artists Center, later renamed The Post-Contemporary. Former meeting halls for the congregation have proved to be perfect open-air studios. In 2006, the Hallwalls Contemporary Arts Center opened in the former Asbury Delaware Methodist Church. Hallwalls aims to create a space for aspiring artists to create works that are “critically engaged” with contemporary artistic and social issues. Freedom of expression for artists is what the owners cherish the most. Once a Methodist Church, Hallwalls Contemporary Arts Center encourages socially conscious art. St. Kieran’s Community Center for the Arts, previously St. Kieran Catholic Church, today strives to be "a cultural hub in one of New Hampshire’s most rural, isolated and economically depressed regions." The former altar is frequently used as a stage for concerts and exhibitions. 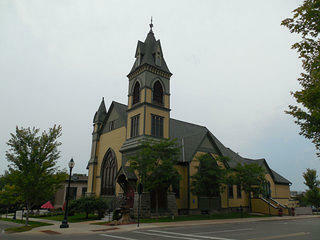 After an old United Methodist Church in Petoskey, Michigan, built in 1810 went up for sale in 1978, it became the home of the Crooked Tree Arts Center. After some modest renovations, a new art center catering to some 50,000 people each year was opened. Crooked Tree both hosts performances by professional dance, theater, and music groups and educates the public in a two-county area about art. 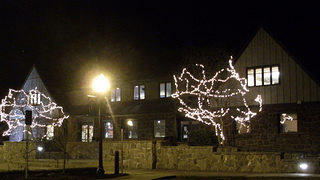 Since its opening in a former Methodist church in 1978, Crooked Tree now provides the arts to 50,000 people each year. Town Hall Seattle is one of the Pacific Northwest city’s leading cultural venues, hosting everything from lectures by prominent writers to punk concerts. In the 1910s and 1920s, the building served as the Fourth Church of Christ the Scientist. The rustic architecture of Trinity Lutheran Church in Hillsboro, Oregon, has proved to be the ideal location for the Glenn & Viola Walters Cultural Arts Center. 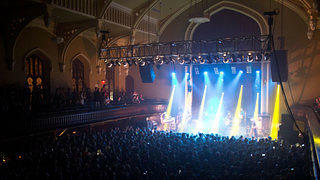 The former pews serve as seats for 200 spectators of concerts and plays, while community banquets and ceramics and visual arts classes are held in other parts of the former church. What once were church pews now seat an audience of 200 at the Glenn & Viola Walters Cultural Arts Center. So far, we’ve talked only about former churches being used as art centers. However, in some cases a church may continue to play its original role while at the same time it is used for secular artistic purposes. The intact Greek Revival First Baptist Church—a National Treasure in New Bedford, Massachusetts—is currently exploring a creative partnership with a local theater company. This “shared-use” model would allow the building to be rehabilitated.